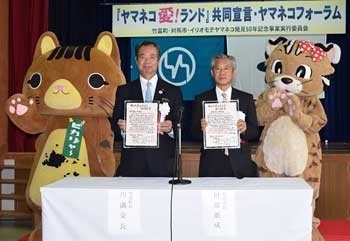 On October 8, Taketomi Mayor Eicho Kawamitsu (left) and Tsushima Vice Mayor Naoki Hitakatsu (right) signed the joint declaration and stated that they would work together on creating an environment where humans and wildcats can coexist. On October 8, Taketomi Town, Okinawa and Tsushima, Nagasaki announced,”Yamaneko Ai (love)! Land Joint Declaration” in an effort to promote the conservation of the Iriomote Yamaneko and Tsushima Yamaneko. The cats are the only endangered wildcat species in Japan. At the Taketomi Town Remote Islands Development Center, Taketomi Mayor Eicho Kawamitsu and Tsushima Vice Mayor Naoki Hitakatsu read the joint declaration and stated that both municipalities would work together to conserve the Wildcats. The joint declaration was part of the 50th anniversary of the discovery of the Iriomote Wildcats.